Chiang Mai, Thailand is one of my favorite cities in Southeast Asia. 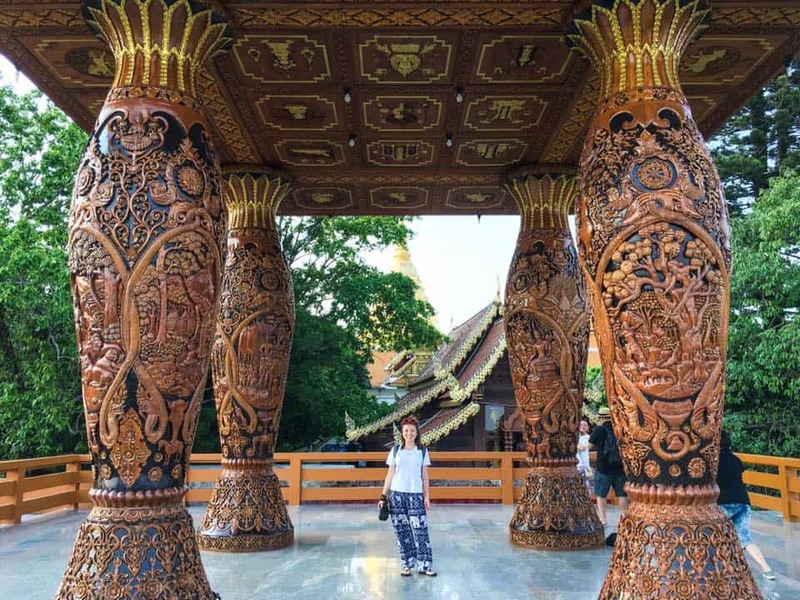 With its abundance of beautiful temples, delicious Northern Thai cuisine, rich expat culture, and overall laid-back atmosphere, Chiang Mai is a city I could see myself revisiting time and time again. 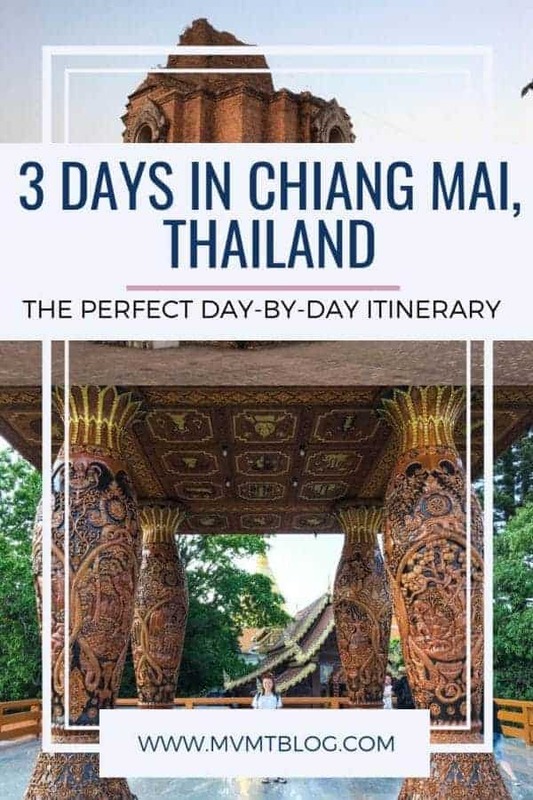 I would recommend adding at least three days in Chiang Mai to your Thailand itinerary, but if you have more time, you can easily stretch this itinerary over four or even five days, perhaps adding a Chiang Mai walking tour or a couple of day trips from Chiang Mai to your itinerary. 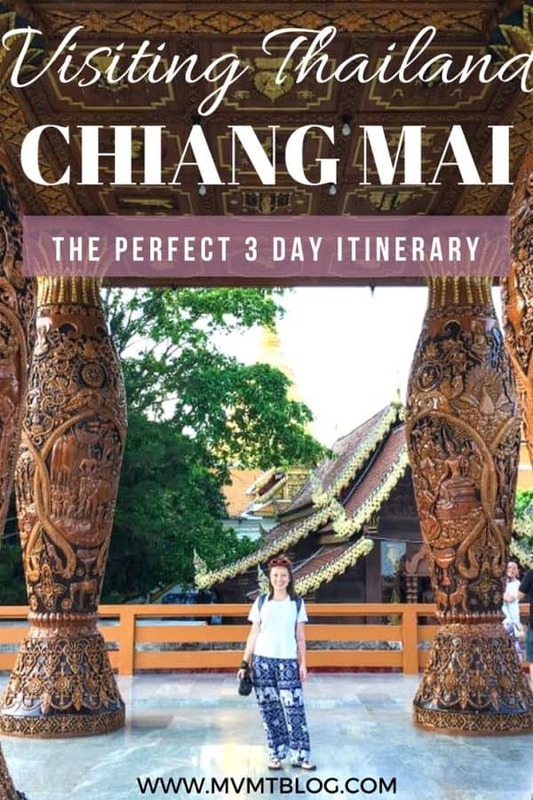 Here is the perfect 3 day itinerary for what to do in Chiang Mai. Dress Code: Casual and Western. Shorts and tank tops are acceptable for ladies, except inside temples. Make sure your knees and shoulders are covered when visiting temples (this applies to men and women). Transportation: Walk/Uber/Shared Taxi. Most places within Chiang Mai Old City are walkable. The best alternative to walking is Uber. 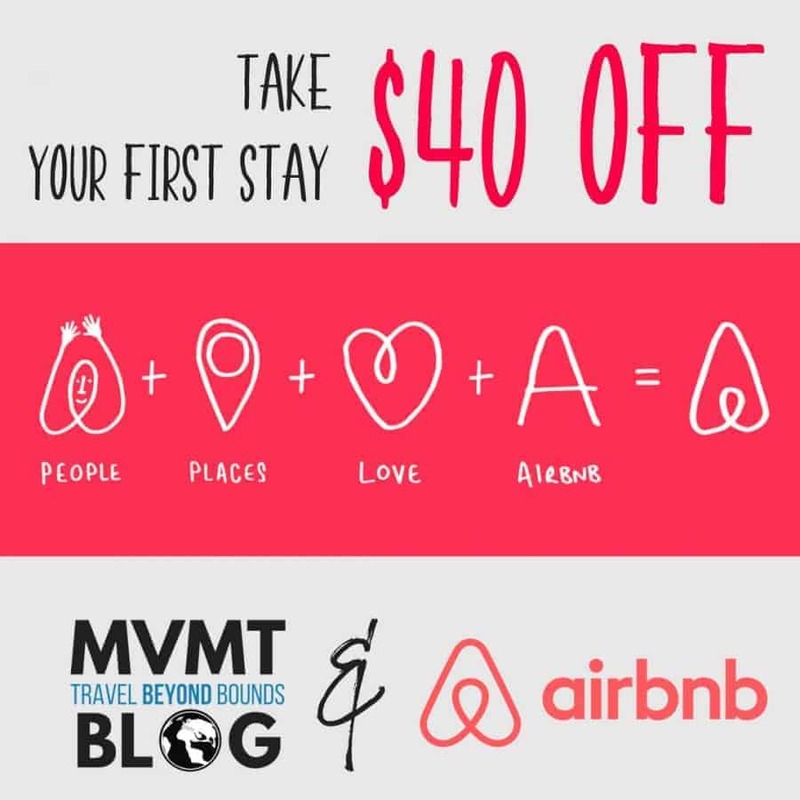 It is extremely affordable compared to most major cities in the U.S. Since Uber is illegal in Thailand, Uber drivers may ask you to sit in the passenger seat so as to give the appearance that you are a friend of the driver, and not a customer. If there are no Uber cars available, take a shared taxi. Look for red trucks with an open back and a long bench on both sides of the interior. You will see them everywhere on the street. 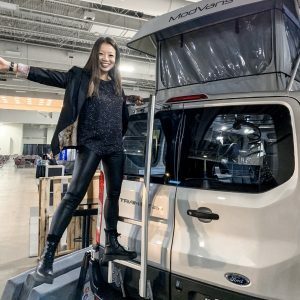 Simply stand on the side of the street and wave one down, and make sure you negotiate the cost of your ride with the driver prior to getting into the truck. Accommodation: De Lanna Boutique Hotel. This beautifully designed boutique style hotel is centrally located in Chiang Mai Old City and within walking distance to many temples and restaurants. Guests at De Lanna Hotel receive a complimentary buffet style breakfast, access to the outdoor pool, access to the hotel bar, and many rooms even have private balconies. If you are arriving in Chiang Mai in the morning or during the day, follow this itinerary. If you are arriving at night and have a full day as your first day, start with Day 2, and move Day 1 to the end of your itinerary. After checking into your hotel, head over to Tikky Cafe in Chiang Mai Old City for a delicious and affordable lunch. Here, you can find authentic Thai cuisine, as well as vegetarian, vegan, and gluten-free options on their large menu. The owner of Tikky Cafe is very friendly and speaks good English. 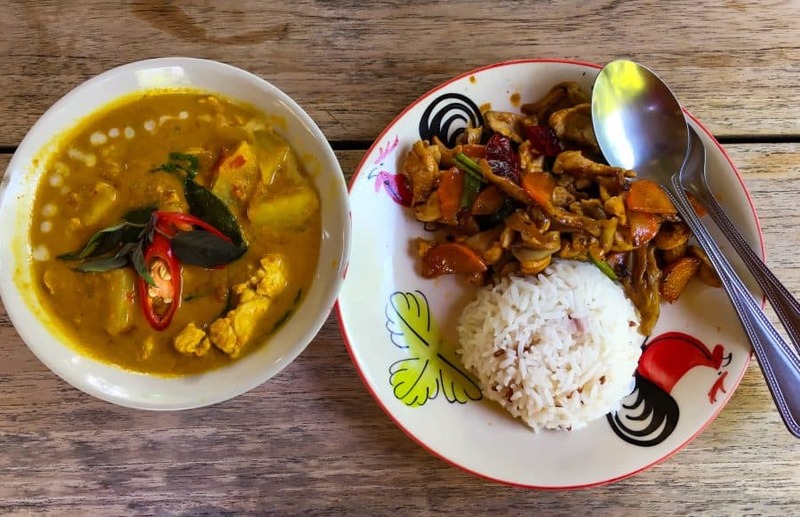 You will want to load up on food here as you’ll be spending your afternoon exploring a few of Chiang Mai’s most well known temples. With over 300 wats (Buddhist temples), Chiang Mai has more temples than you’re able to see in a lifetime. 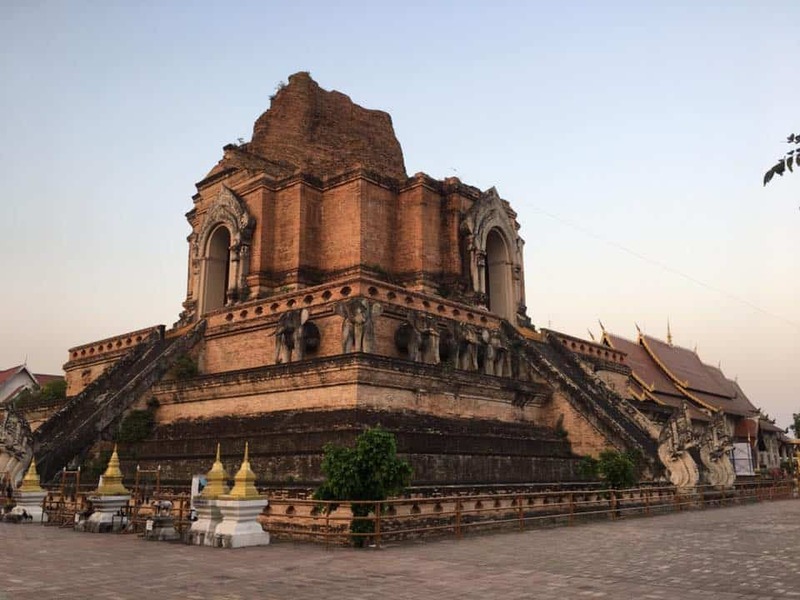 On your first day in Chiang Mai, take a few hours to visit three of the city’s most iconic temples: Wat Phra Singh, Wat Chedi Luang, and Wat Phra That Doi Suthep. The first two are located within Old City walls and are within walking distance from each other. 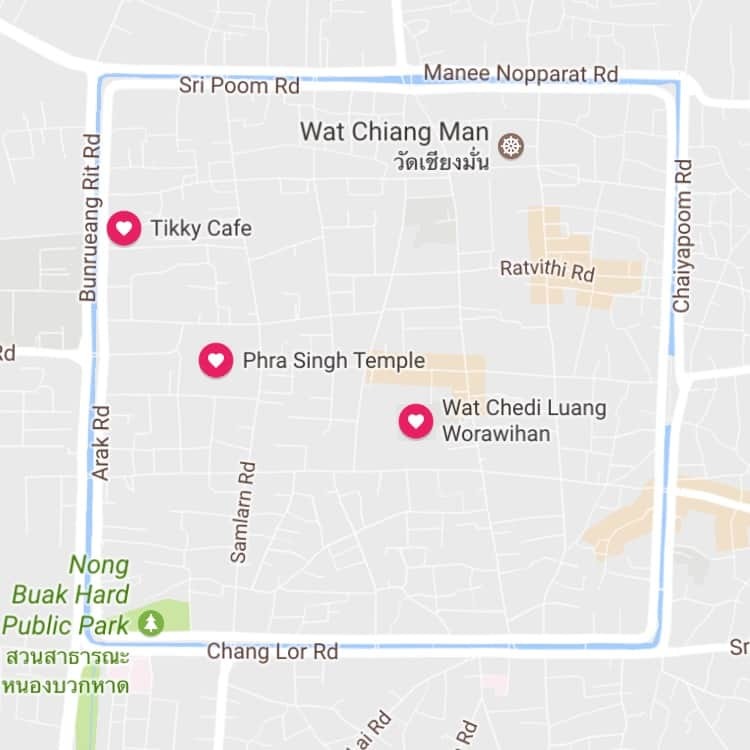 My recommendation would be to download the map for Chiang Mai from Google Maps and save each temple as a pin on your map. From Tikky Cafe, walk first to Wat Phra Singh. This walk is approximately 700 meters and should take less than 10 minutes. Next, walk to Wat Chedi Luang, which is approximately 1.1 kilometers from Wat Phra Singh and should take less than 15 minutes. 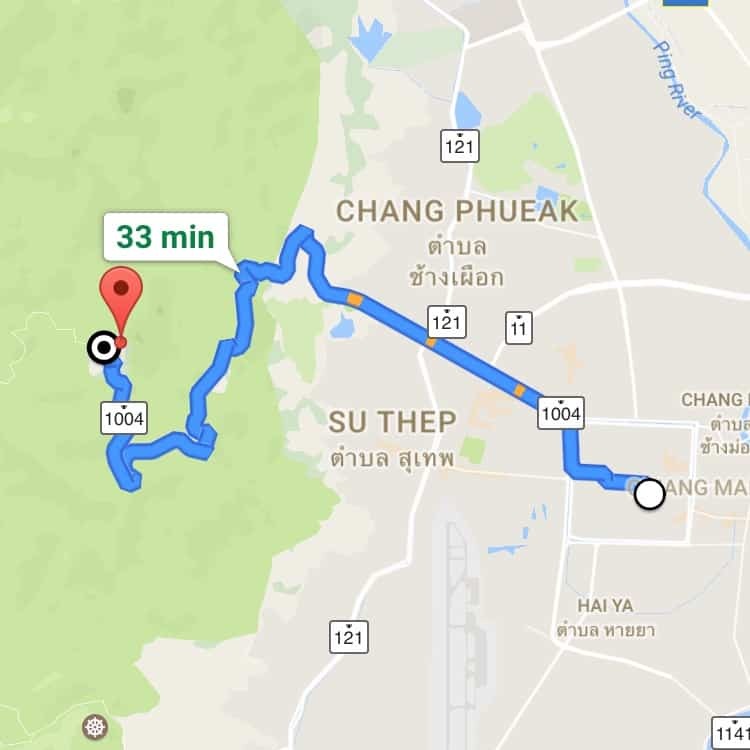 Finally, order an Uber from Wat Chedi Luang to take you roughly 17 kilometers (30-40 minutes by car) to Wat Prathat Doi Suthep. Wat Phra Singh was originally built in 1345 by King Phayu as a place to house his father’s ashes. About 250 years later, Northern Thailand was overtaken by the Burmese, and Wat Phra Singh was abandoned. It wasn’t until the late 1700s that the temple was restored by King Kawila. The entire temple again underwent extensive renovations in the 1920s. Most recently in 2016, the chedis (stupas, or dome-shaped structures erected atop Buddhist temples) were decorated with a gold-color covering, giving Wat Phra Singh the iconic look it has today. 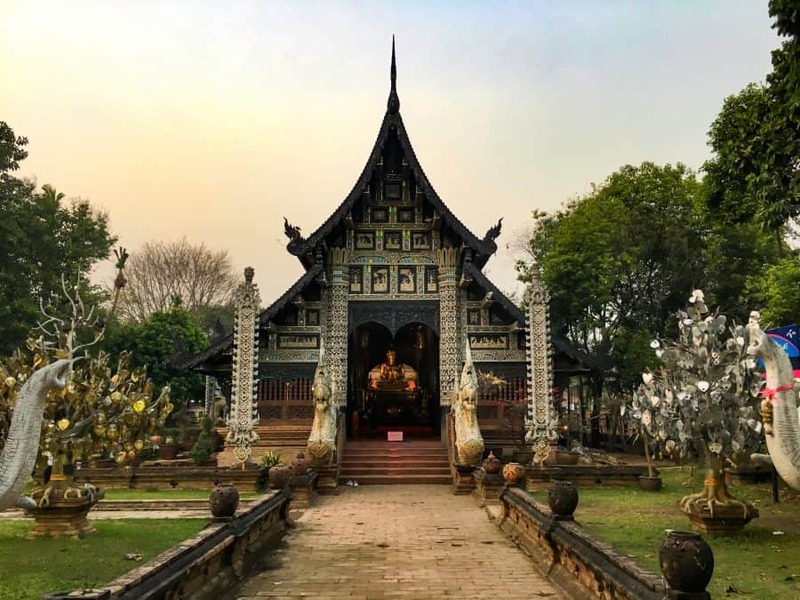 Wat Chedi Luang is a must have on your Chiang Mai itinerary. It was my favorite temple in Chiang Mai because of its towering stature and departure from the traditional Lanna-style chedi seen on many temples in Chiang Mai. Construction on Wat Chedi Luang started around the same time as construction on Wat Phra Singh, but Wat Chedi Luang was left unfinished until the mid-15th century. Shortly thereafter, the Emerald Buddha was installed in the eastern portion of Wat Chedi Luang but was subsequently moved to Luang Prabang due to an earthquake that struck Chiang Mai and destroyed a portion of the temple. Wat Phra That Doi Suthep was founded around the same time as Wat Phra Singh and Wat Chedi Luang and expanded over time with more and more shrines. Although it is oftentimes referred to as “Doi Suthep,” this is a misnomer as Doi Suthep is actually the name of the mountain where the temple sits. Wat Phra That Doi Suthep is located approximately 30-40 minutes from Chiang Mai Old City. The easiest way to get there is by Uber. If you are unable to order an Uber on your way back, there are shared taxis parked near the entrance that you can take back to Chiang Mai Old City. Rather than going straight back to Chiang Mai’s Old City, however, I decided to explore the area west of the Old City for dinner and dessert. For dinner, I met a few of my friends at a restaurant called Eat is Life, a clean and modern looking restaurant specializing in vegetarian and vegan food. There are plenty of options for non-vegetarians as well. Next door to Eat is Life is a beer bar, and there are many other bars and restaurants in the same area. We decided to end our night with some ice cream from Ice Love You Ice Cream, which has a huge selection of ice cream flavors and creative ice cream concoctions. This is one of the few ice cream shops I’ve seen with a special vegan ice cream menu in addition to its main menu. The ice cream here was delicious and the atmosphere lively. After spending a while unloading our sugar high onto each other, we headed back to our hotels for an early night’s sleep. 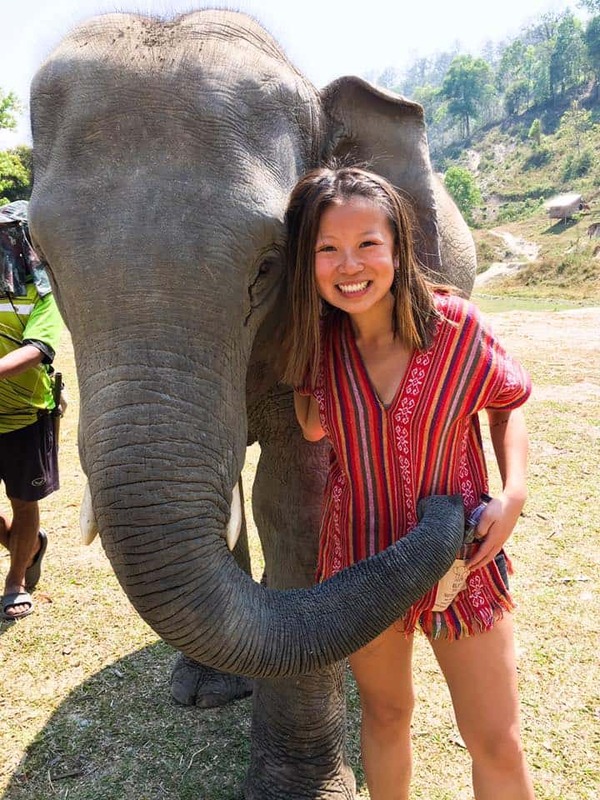 One of my favorite memories from Chiang Mai, and by far one of the top things to do in Chiang Mai, was volunteering at Elephant Jungle Sanctuary. It was by no mistake that the day I went to the elephant sanctuary was also my birthday. 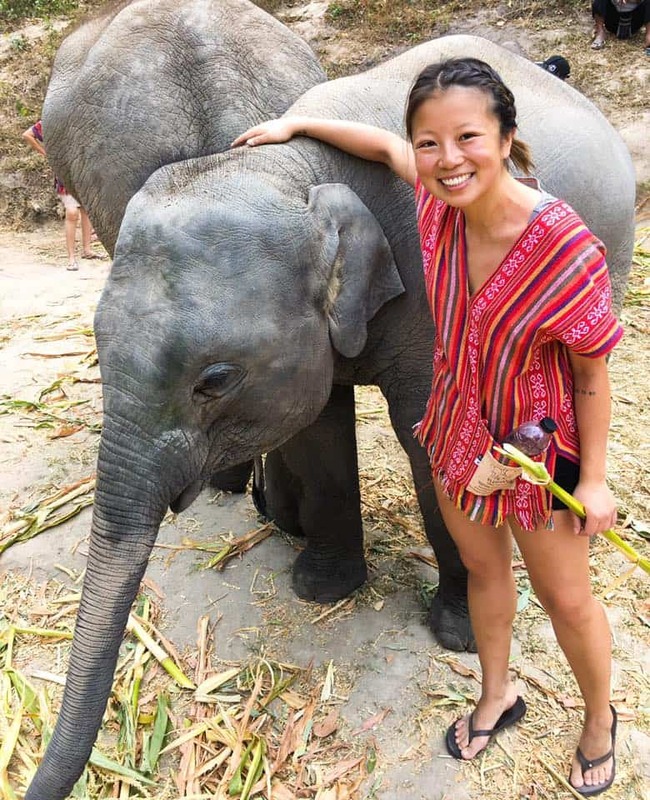 For as long as I can remember, my favorite animal has been the elephant, so when my friends asked what I wanted to do for my birthday, my only request was a trip to Elephant Jungle Sanctuary. The four of us got up early on Day 2 and were picked up from our hotel at 8:00 AM in a shared taxi. There was only one other girl in our taxi, but we met up with a larger group once we reached the sanctuary. The ride to the sanctuary took approximately two hours, and the latter part of the trip brought us through jungle dirt roads, which was very bumpy. Once we got to the sanctuary, we were given special shirts to wear while handling the elephants. The guides explained the plight that elephants face in Southeast Asia and the history behind that struggle. A long, long time ago, minority groups in the mountains used elephants as mules, to help carry and transport products and people. Despite the native people’s love for elephants, they could find no other means of transportation and were thus faced with no other option. Later, as riding camps opened up across Thailand and the rest of Southeast Asia, and as the market for elephant riding grew, those who owned elephants sold their elephants to riding camps as a way of making a living. Today, Elephant Jungle Sanctuary houses seven elephants, including one baby, who were all rescued from riding camps across northern Thailand. After explaining this depressing bit of history, our guides passed out bunches of bananas to each volunteer and instructed us on how to feed the elephants. We were given the option of allowing the elephants to take the banana out of our hand using their trunks, or shouting “BON BON!” while raising an arm to get the elephants to raise their trunks so that we could place the bananas directly inside their mouth. At one point, my friend accidentally allowed an elephant to grab a bunch of bananas still attached to the stem out of his hand. We both panicked that the elephant would not be able to digest the stem and that we had just caused harm to the elephant. Just as quickly as our panic rose, our fears were acquiesced as we watched the elephant rip the banana off the stem efficiently and with ease, and drop the stem onto the ground. I was, and still am, amazed by how smart and adept these animals are. After a full day of feeding the elephants, making medicine (vitamins) balls for them, playing in the mud with them, bathing them, and observing them, we took the two hour ride back to Chiang Mai Old City. This was by far one of the best day trips from Chiang Mai that we could’ve taken, but our first order of business when we returned to Chiang Mai was to take a long, much needed shower before heading out to eat and explore Chiang Mai’s night markets. 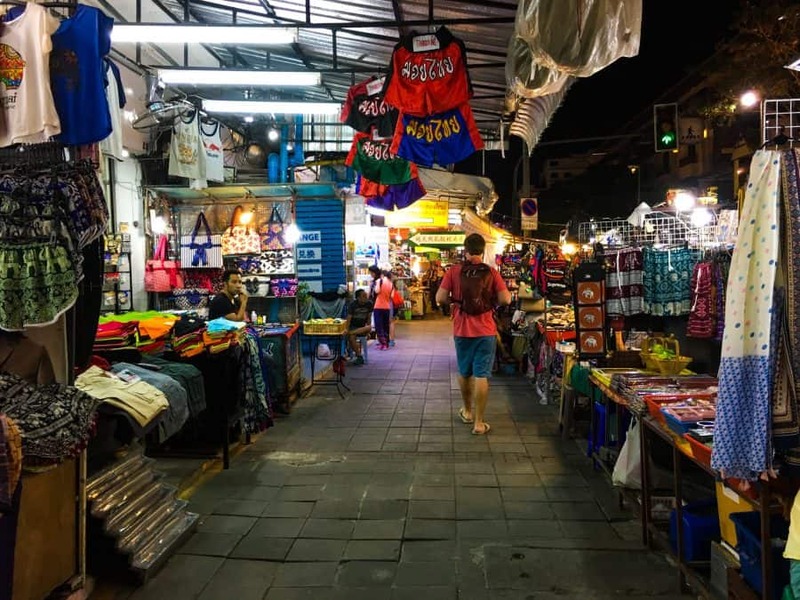 Chiang Mai’s Night Bazaar opens from 6:00 PM to midnight every day. 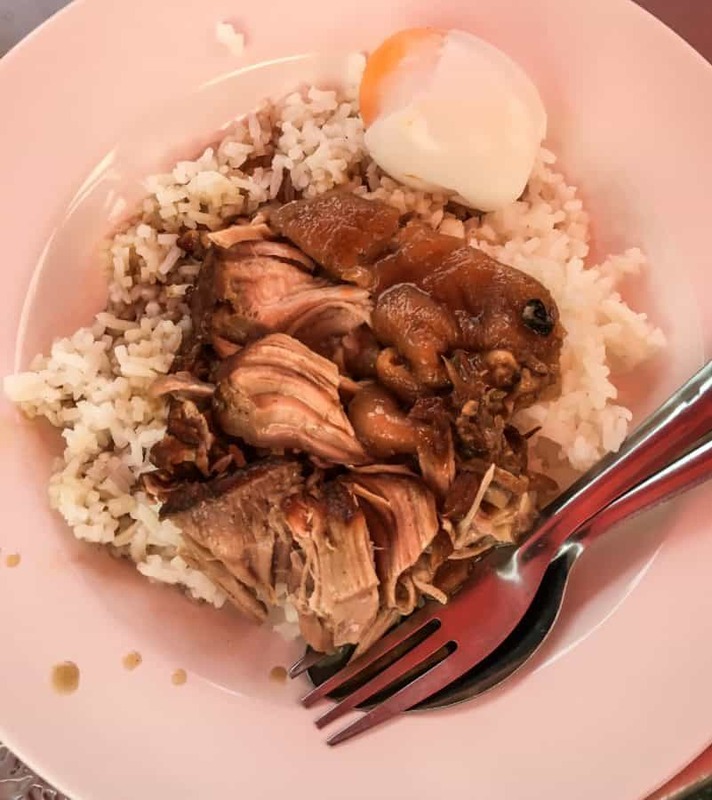 You will find a lot of delicious food in and around the Night Bazaar, including Khao Kha Moo, a street stand famous for its pork leg. In addition to being known for its pork leg, this street stand is also famous for the “cowboy lady,” who works at the stand every day while wearing a cowboy hat. The famous plate of Khao Kha Moo came out with rice, pork leg, and an egg. While I thought the pork leg was very good, I’ve tasted similarly delicious dishes before. 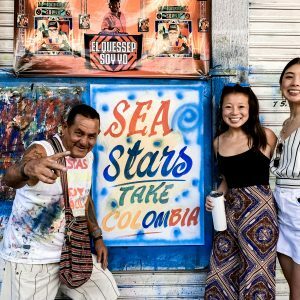 I’m glad I checked it out, but the hype around this being one of the top things to do in Chiang Mai may be more about Anthony Bourdain’s strong marketing than the food itself. We ended the night by walking around the Night Bazaar. As I typically refrain from buying anything abroad, partly due to my light packing, I quickly lost interest. 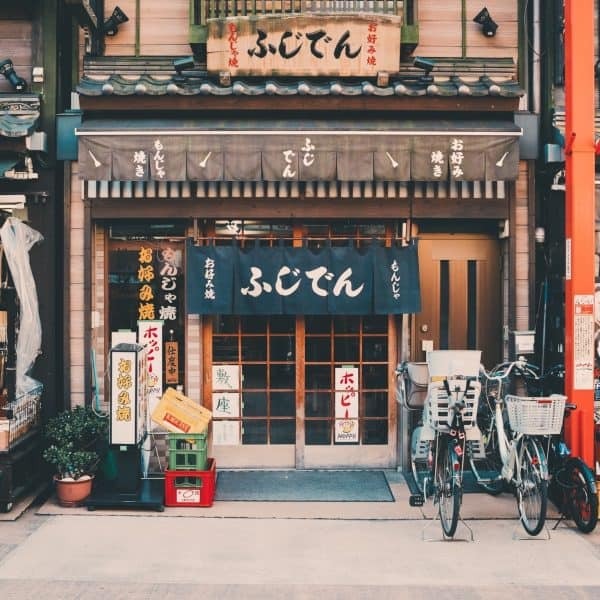 However, the markets sold everything and anything, so if you are looking for gifts, souvenirs, or products of any kind, you will most likely be able to find them at the Night Bazaar. 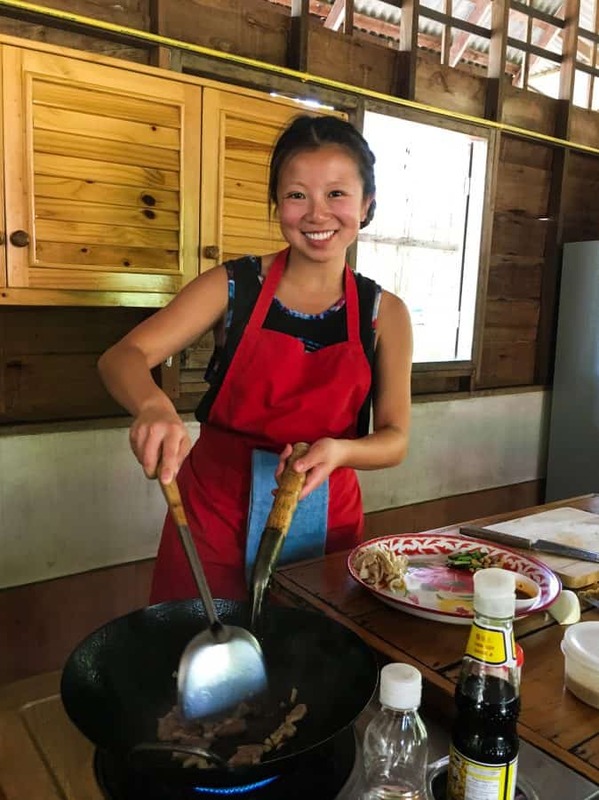 On your final full day in Chiang Mai, I would highly recommend signing up for a Thai cooking class with Thai Farm Cooking School. As a full disclaimer, cooking is one of the things I least enjoy doing in life, although eating is one of the things I most enjoy. However, since I had heard such great things about the cooking classes in Chiang Mai, I decided to give it a try, and let’s just say I was not disappointed. I would add this to the list of best day trips from Chiang Mai as well. My friend and I were picked up from our hotel at 8:30 AM by our cooking teacher and guide for the day, Yummy (what a fitting name for a cooking instructor). 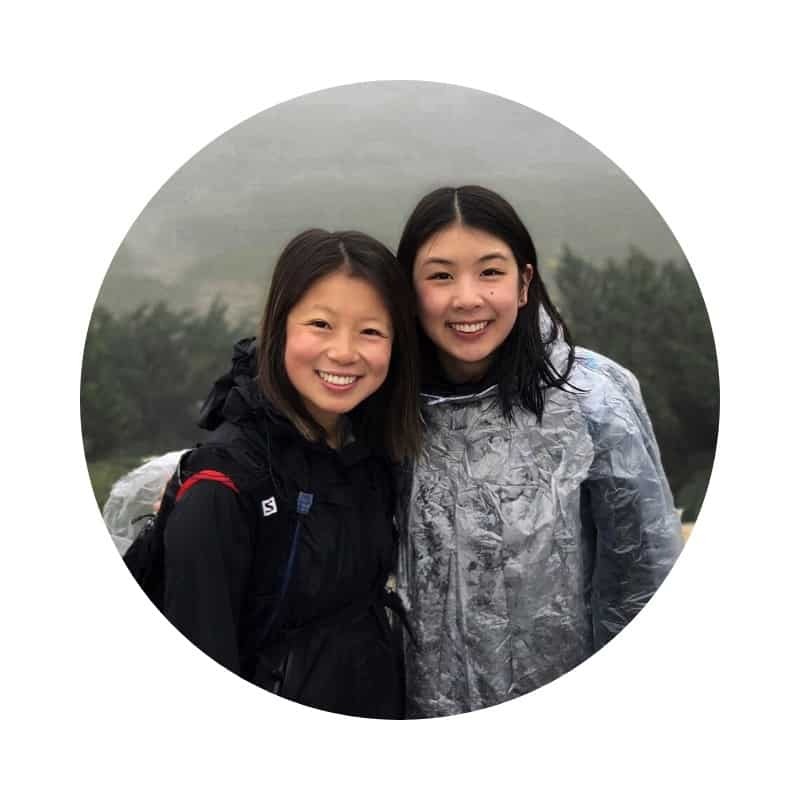 The first stop on our journey was a local supermarket, where Yummy showed us some of the ingredients we would be using in our dishes, many of which I had never seen or heard of before. After walking around the market and buying a fresh coconut to sip on for the duration of the ride, we got back in the van, and Yummy drove us the rest of the way to the organic farm where we would spend the rest of our day. 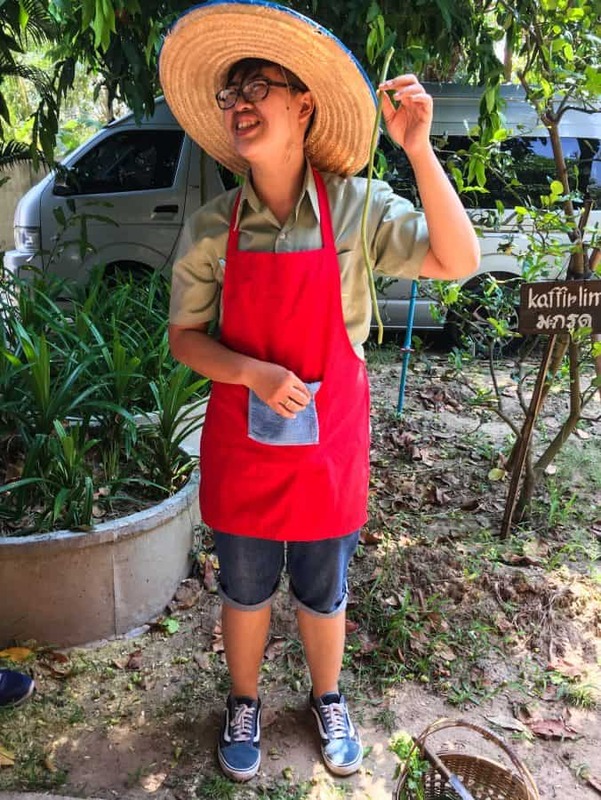 Once we arrived at the farm, Yummy gave us a tour of the gardens and showed us even more plants I had never seen or heard of before. All of the plants Yummy introduced to us ended up being key ingredients in our dishes. We made a total of seven dishes that day, including appetizers, main entrees, and a dessert. The cooking class typically concludes at around 2:00 PM, and the drive back to Chiang Mai Old City takes approximately one hour, so expect to be back at your hotel by 3:00 PM. After arriving back in Chiang Mai Old City, use your downtime before dinner to take a nap or get a famous Thai massage. 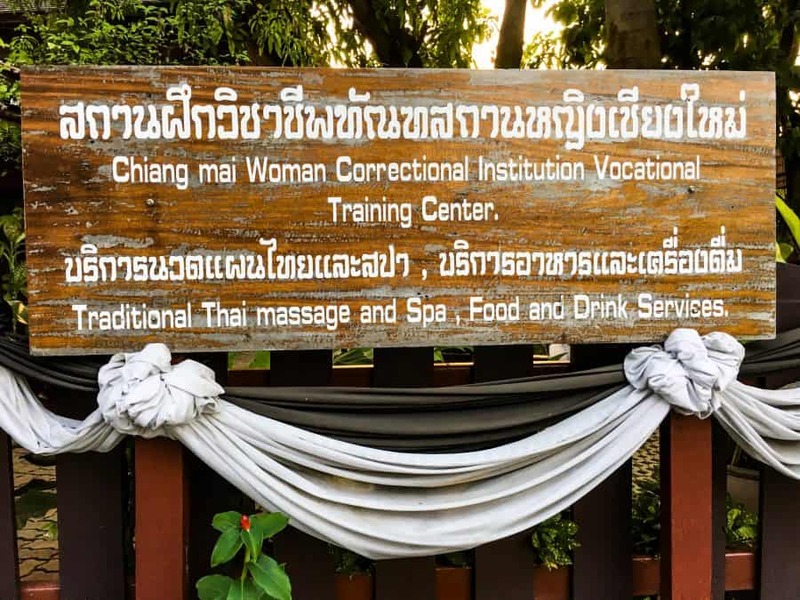 One great way to support local women in need is by getting a massage at Lila Thai Massage, a massage parlor inside the Chiang Mai Women’s Prison. The massage parlor was founded by a former Director of the Women’s Prison in order to help incarcerated women gain the skills necessary to reintegrate into society once they are released. While I did not need dinner that night as I was stuffed from eating all the food I made at the cooking class, if you are hungry, head over to Khao Soi Khun Yai and order a bowl of their famous khao soi. Just a few dollars will get you a steaming hot bowl of khao soi, a dish native to northern Thailand. Finally, finish off your night at the North Gate Jazz Co-Op, just a few minutes’ walk from Khao Soi Khun Yai. North Gate is one of the coolest music venues and bars in Chiang Mai, visited by locals and tourists alike. When the inside bar area is full, patrons simply stand outside and enjoy the live music from the sidewalk. An alternative to taking the Thai cooking class, or if you have an extra day to add to your Chiang Mai itinerary, is to visit Doi Inthanon National Park, the tallest mountain in Thailand. Doi Inthanon is part of the Himalayan range, and, in true Chiang Mai fashion, is home to numerous temples. The best way to get there is to rent a car for the day and drive there, as it is quite a distance from Chiang Mai Old City. Alternatively, if you do not wish to drive yourself, you may wish to hire a private driver for the day to take you to the mountain and back. Keep in mind that it is possible to hike around Doi Inthanon for hours while visiting its numerous temples and waterfalls. 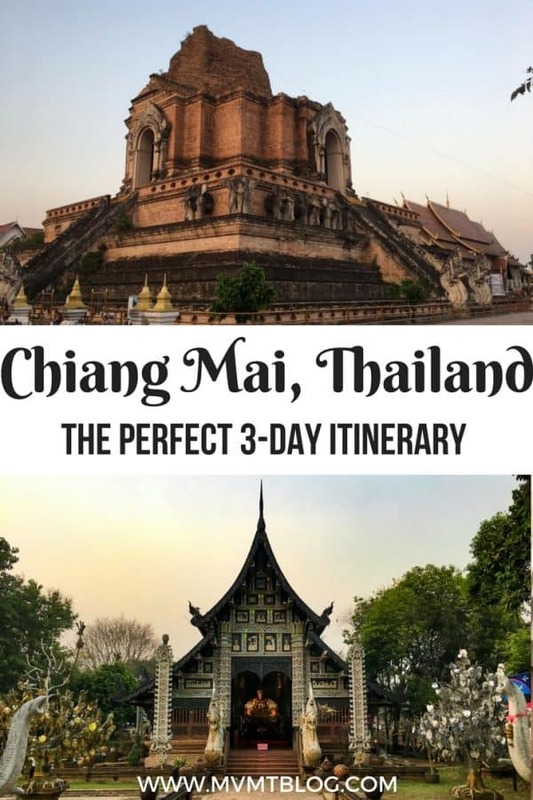 Our perfect 3 day itinerary for what to do in Chiang Mai will help you to see the main sights but leave you wanting more. I have no doubt I will return to Chiang Mai one day, and when I do, I hope to see you there! I was in Chiang Mai three weeks ago and did almost the same activities. It is a great tactic to pin the temples on the Google map as they are fairly close to each other, I missed the elephant sanctuary. I feel like going back there after seeing the picture of you happily with the elephant and the banana incident brings a smile to my face. Definitely want to return there if I have a chance to visit Thailand again. I haven’t been to Thailand yet. So thanks for this itinerary and virtual tour. Thanks for the tips, esp about dress code in temples! Good to know Tikky Cafe has veggie friendly menu. The temples and all those sculptural detailing is so fantastic. And you look like you had an awesome time with those elephants too! Chiang Mai is really an incredible city. It is a paradise for vegetarians too as there are so many vegetarian friendly restaurants all over the city. 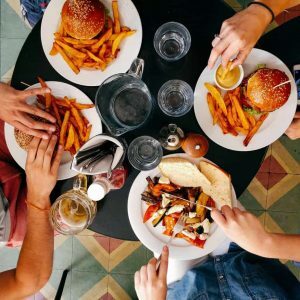 One of the friends I was traveling with is vegetarian, and there were so many restaurants she wanted to try that she didn’t even have time to try them all! There’s a lot to do in Chiang Mai and you’ve laid it out really well. The baby elephant is adorable. Thai food is my favourite and everything here looks so delicious. I’m so glad you did the cooking class! Your mango sticky rice looks beautiful AND delicious! Did they give you a recipe book to take home with you? I was craving mango sticky rice one day and I have yet to find a place that sells it in the US so I had to make it myself. I still have my recipe book from the cooking class we took in Chiang Mai. Also, happy belated birthday! I too spent my birthday in Thailand last year. Looks like you had a great time! I’m so glad I saw this post. I’m traveling to Thailand this fall and I’m currently filling out the itinerary. Looks like you had a lovely time. Now I know where to go, thanks! Great article you two. We’ve still not left Europe but want to go to Asia one day. Chiang Mai seems to be the hot spot for digital nomads and travellers right now. 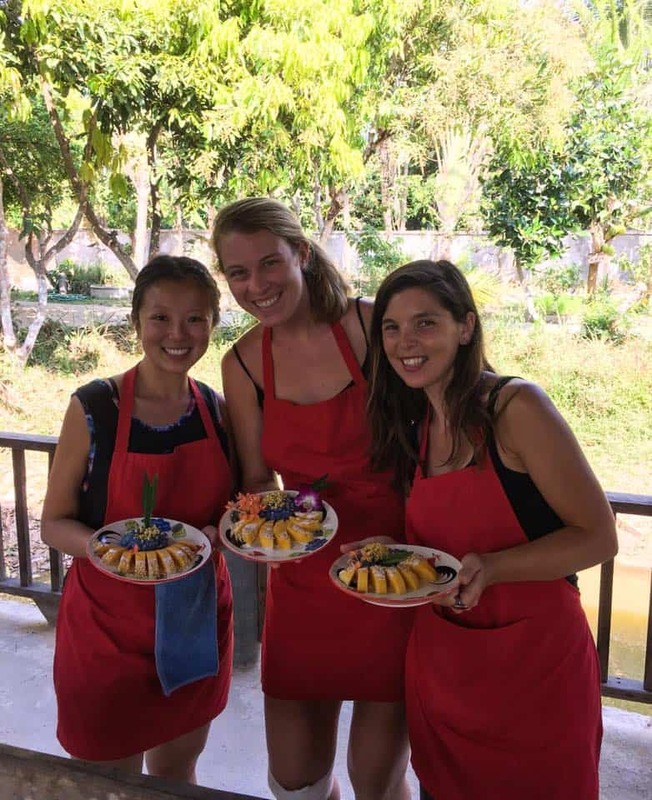 The cooking class seems really cool and something we added to our list once we get to Chiang Mai. How did you like North Gate Jazz Co-Op? We love Jazz and are always on the look-out for cool venues. I LOVE Chiang Mai! 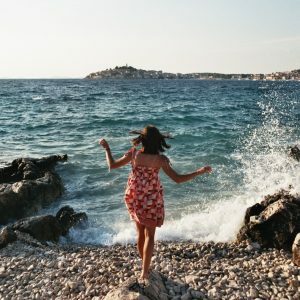 This is such a great itinerary! I actually did a lot of biking in the area to get around. Even though it’s usually really hot outside, it’s a great way to get around! I haven’t been to Wat Doi Suthep for years, I loved the drive up there, so picturesque. 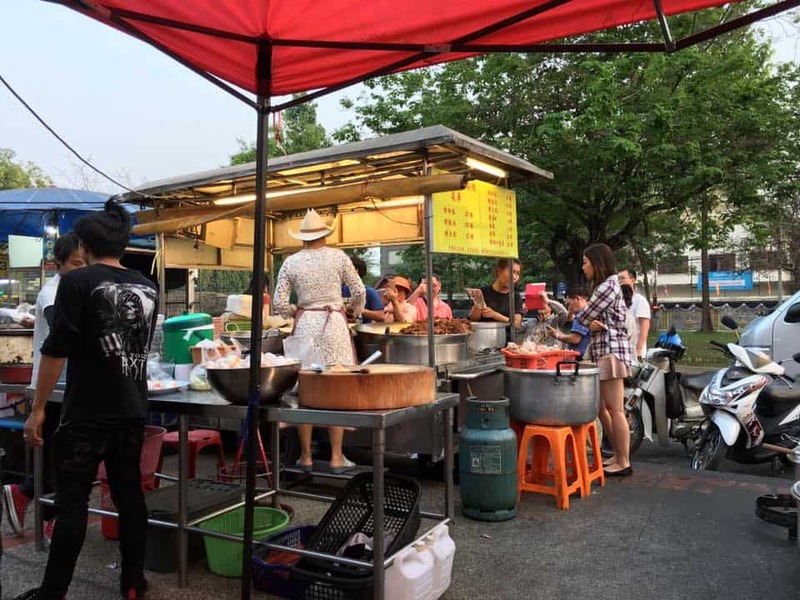 We often go on golfing holidays to Chiang Mai and enjoy the food and nightlife downtown in the evening, around the Night Bazaar is a good place to start a night out! The elephant sanctuary looks an interesting visit. 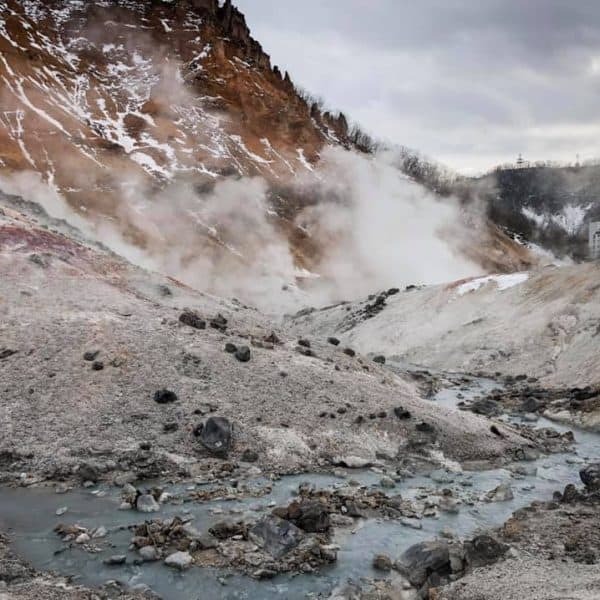 I am visiting here in November! I can’t wait! Thank you for a great read! Pinned for later. 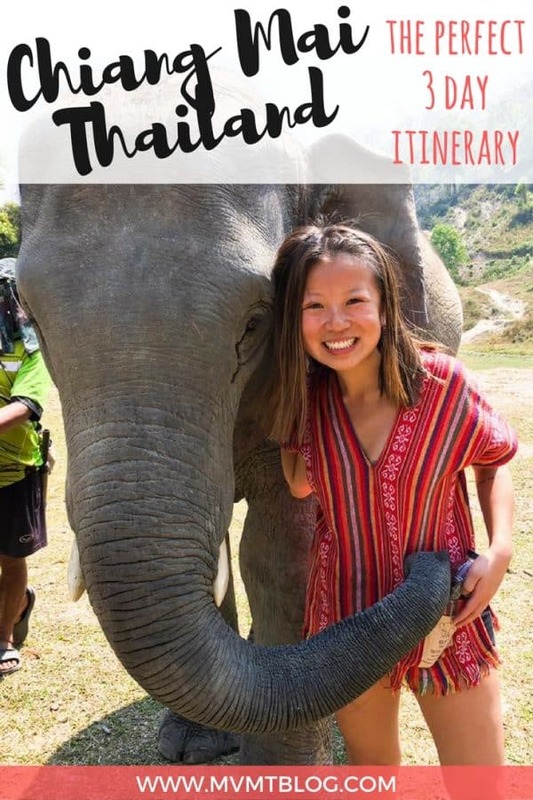 I love that your itinerary for Chiang Mai is different and includes unique things to do, like visiting the Elephant sanctuary or joining a cooking class. I feel so sorry for these wonderful creatures, the elephants, and for the ways they are still abused because tourists want to ride them. I had a chance to be close to an elephant in India and the way it would hug me with its trunk and respond when I would pet him it was heartbreaking. Because I knew that elephant, in the morning, was sent to the fort to “work” (to carry tourists). And there was nothing I could do to prevent it, but write about the experience. Funny anytime I see this type of comment. Why? It’s funny because it seems like, in their point of view, using elephant is bad, at the same time they feel nothing using horses/cow/chicken/ect. in a farm. Remember they too have to get up every morning to “work”. Some have to let tourists ride them. If you say elephant is not born to be rise so riding them is abuse, may I ask how about horse? Is it born to be rise? Have you ever see clips about dogs trained to walk with their hind legs or front legs by many Westerners. You feel they are cute and like the clips. Yet have you ever ask if dogs were suppose to walk that way? Some despise riding elephant yet they enjoy dolphin show or killer whale show in aquariums like Sea World. Shamu and its baby right? Hardly see anybody rise words against them. On the opposite I see all the blames against elephant. Somehow it seems to me that the only “wrong” is that these activities are done by Westerners, but the others are not. Omg Chiang Mai looks so fun! I have to admit I never knew much about it, now I feel like I have to pay it a visit 😀 Great photos, too! Chiang Mai looks amazing, I’ve head nothing but good things about this place. I can’t wait to get to Thailand during our our travel! It makes me so happy to see that people are becoming wise to the treatment of elephants for riding. The sanctuary looks a lovely place to visit. Wow Chiang Mai looks like a really interesting destination. I must pay a visit. 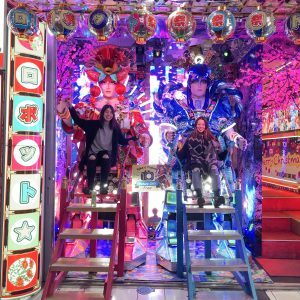 Congrats you managed to fit a lot into 3 days and it’s a super itinerary. Chiang Mai is a stop that I want to make while in Thailand. Thank you so much for this detailed itinerary. This is so helpful. Sounds like a great way to explore the city. Really like what the elephant sanctuary is doing and the night market looked exciting. 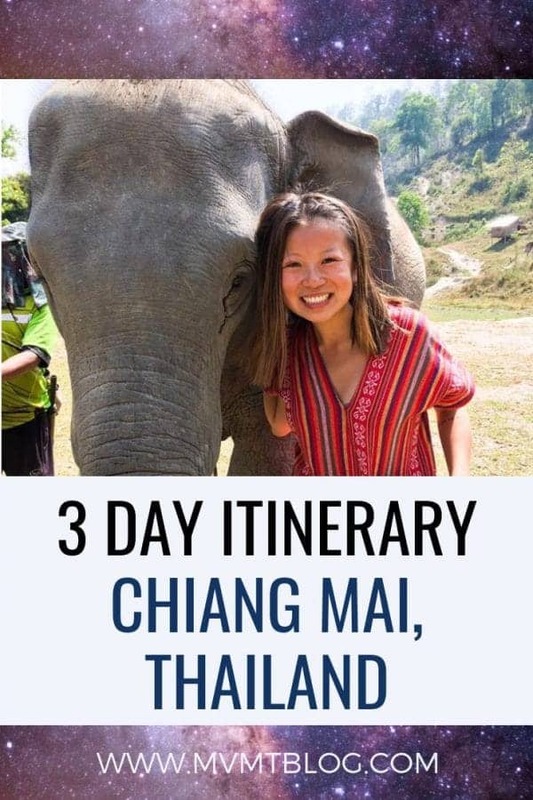 Chiang Mai, I’ve been dreaming of stoping there since I’ve been planning to go to Thailand for quite a long time, and I’m so glad I found your post, I’m going to keep this one, so I can bookmarked it when I will fly there! Your photos are just amazing tho! Love Thailand so much! But sadly we didn’t get chance to go to Chiang Mai last time we visited. It looks great and I’ve heard so much about the place from friends who’ve been. Thanks for sharing your tips and suggestions, great stuff! Will pin for reference. 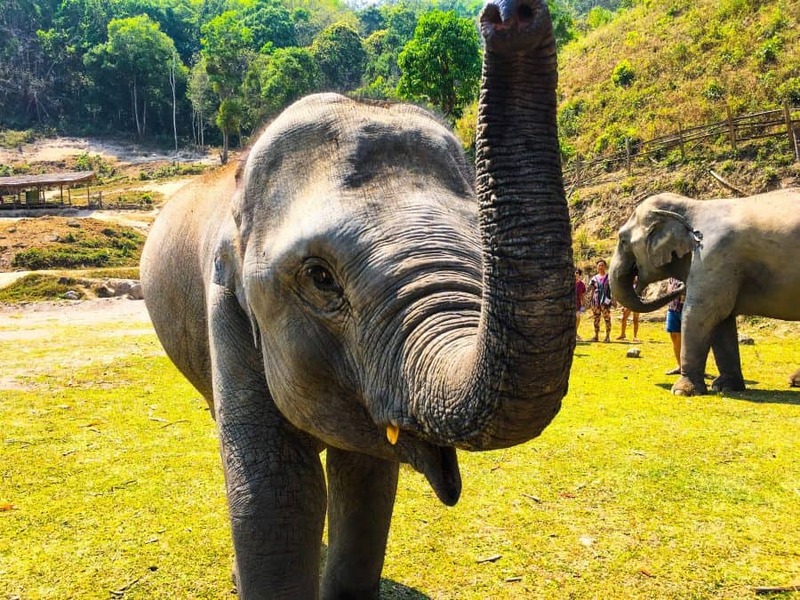 We’d definitely go to the elephant sanctuary as we’ve been to another one in Thailand and really enjoyed the experience, so important to educate people not to ride these beautiful animals. I know a lot of Aussies living in Chiang Mai and they love it. I’m yet to visit but that won’t be the case for much longer. Will definitely head to the elephant sanctuary, that baby is so cute! 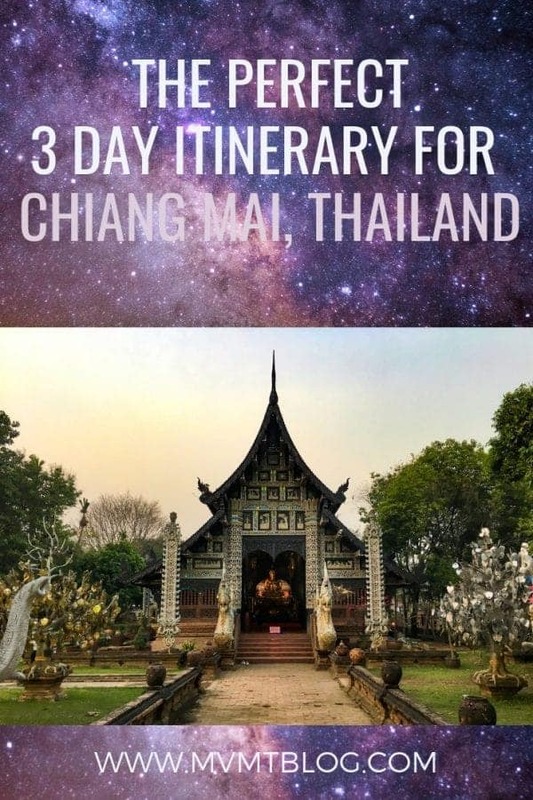 Great 3 day Itinerary for Chiang Mai. I missed it on my visits to Thailand. Great photos and I pinned this for my next trip to Thailand. Such a jammed-packed 3 days! That’s how we love to travel. If I’m going to fly around the world, I want to see as much as possible. Pinned this! There are very few places like Chiang Mai. It’s one of my favourite places in the world and I love it almost unconditionally. I would suggest timing your visit for the weekend as the Sunday Night Walking Street market is definitely worth visiting and is way cooler than the Night Bazaar. 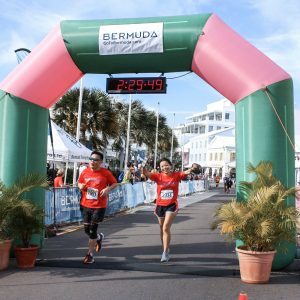 Great tips and you guys managed quite a lot in three days! 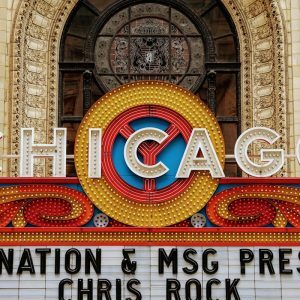 This looks like a great 3 day itinerary! Taking a cooking class in Thailand is on our list. Mango sticky rice! Yum! The columns at Wat Phra That Doi Suthep are impressive! The details and colours! Wow! Thanks for sharing. A CM local stumbled upon your blog. Hope you don’t mind a bit correction/addition info. …Wat Chedi Luang but was subsequently moved to Luang Prabang due to an earthquake that struck Chiang Mai and destroyed a portion of the temple… >>> The emerald Buddha was moved to Laung Prabang of Lan Xang (Ancient Lao Kingdom) because their king at that time (which was cousin with Lanna (ancient Northern Thai Kingdom) dynasty) asked to borrow it along with 2 others Buddha statues. (Sihing Buddha and White Jade Buddha). Since you are young, I would tell you a bit about some local activity people outside Thailand hardly know. Every year during the first semester, Chiang Mai University student, esp. freshmen, has a traditional ceremony to walk 14 kms (including the walking in the campus) to Wat Prathat Doi Suthep to pay respect. It has been practice for 50-60 years. The rule of the trekking is simple: no one left behind. If your friend’s tired, you have to help. If your friend is a disabilities, you have to push his/her wheelchair. If your friend cannot walk, you have to carry him/her. CM (and TH) is not different from any places in the world. We have both good and bad things, also good and bad people. Hope you see the first ones wherever you go. Welcome and be our guest again anytime. Nice itinerary, which i have pinned, for future use. Thank You! Those elephants, awww, can’t wait to see them!! They might be my favourite animal after Dolphins and Whale Sharks!! I have travelled to Thailand several times and always have missed out on Chang Mai as I’m a lover of the sea and sand and end up on the islands. I really want to go to ChangMai next year and your post makes me want to go more. 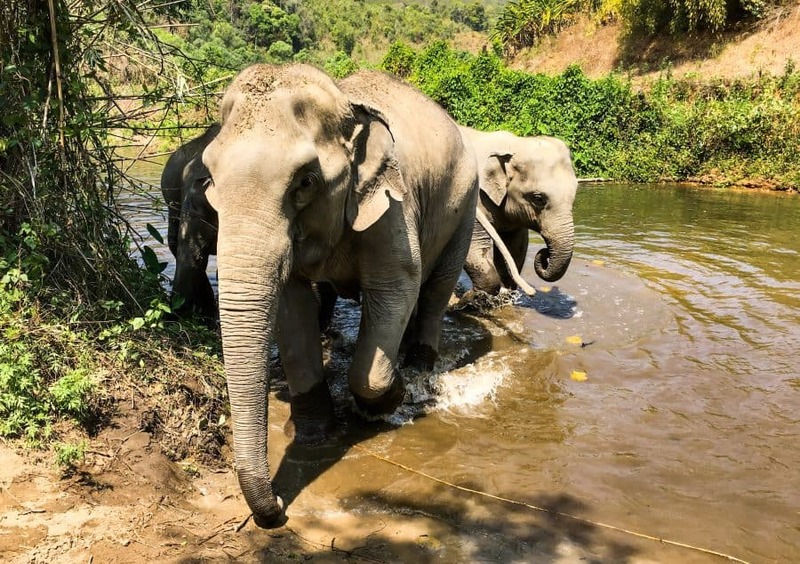 My top thing to do is the Elephant sanctuary and relax in the calmness of the mountains away from the normal hustle and bustle of the city and touristy places like Phuket even. Also on the list is see the beautiful temples and have the delicious Northern Thai cuisine. Did you get a sim card in Chiang mai if so where did you pick one up? I did! I actually got mine in Bangkok because I was there right before I went to Chiang Mai. I was staying at my friend’s house in Bangkok, and she recommended that I go to 7-eleven to get one, so I did, and it was a breeze! I would imagine you can pick one up at the airport in Chiang Mai as well. It might be a bit more expensive, but everything over there is pretty cheap compared to what we’re used to here in the U.S.